The court was established in 2011 and certified by the Office of Court Services January 2012. 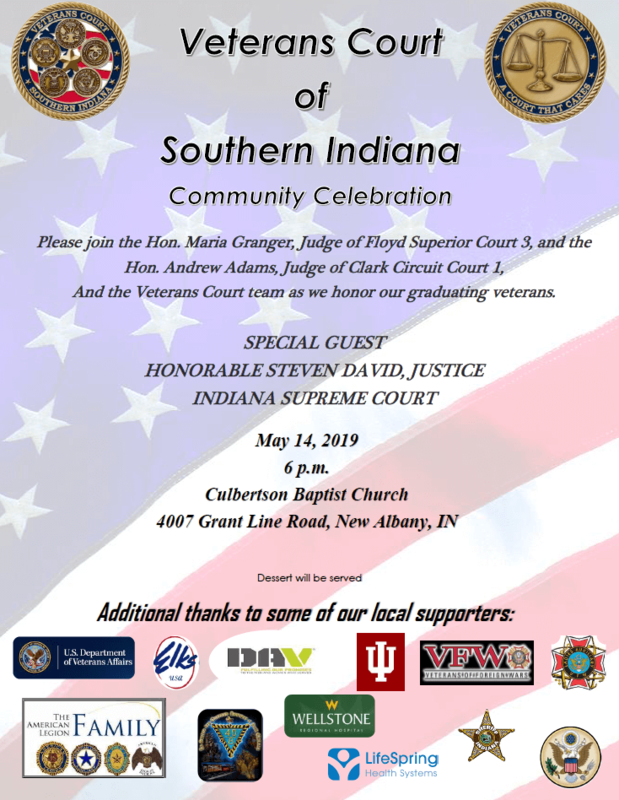 Veterans Court is a community effort of the Court, Prosecution, Defense, Department of Veterans Affairs, Community Corrections, local law enforcement and community treatment professionals in southern Indiana. The team of professionals works together for the benefit of veterans. Participants are required to attend regular court appearances before the Hon. Maria D. Granger, supervising Judge of the Floyd County Veterans Court (Team Alpha) or Hon. Andrew Adams, supervising Judge of the Clark County Veterans Court (Team Bravo). The program requires a total commitment to be clean, sober and healthy and lead a law-abiding life. Participants are required to follow and successfully complete a treatment plan. 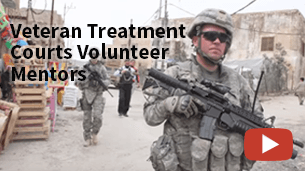 Treatment begins immediately upon the veterans first appearance in court. What is the Purpose of the Veterans Court? The purpose of the Veterans Court of Southern Indiana is to make resources available that will help you and your family overcome stress, problems, and conflicts that may block your recovery process. The Veterans Court team is here to help you and your family to build the skills that you may need to succeed in the Veteran Court. If you follow the rules and structure of the program, your life will get better. We are not saying that it will be problem-free, but we can guarantee that you will be free of the never-ending cycle of getting high to escape problems or being unable to manage your mental health challenge(s). You must arrive on time for Veterans Court and all of your scheduled appointments. Court sessions start promptly at 10:30 A.M. If you arrive 15 minutes after a session begins you may be admonished and told to return at the next sessions. You must attend any and all scheduled court dates, treatment sessions, support group, meetings or conferences. If you miss due to medical issues, you must: 1) call your case manager so a bench warrant is not issued; and 2) provide medical verification to your case manager. If you are having any kind of difficulty, including making your appointments on time, contact a Veterans Court Case Manager. You cannot change your treatment plan on your own. Contact your Veterans Court Case Manager right away if a problem arises. Keep your scheduled appointments with your attorney to ask questions of him or her, especially if you are confused or uncertain about the Court process. The Veterans Court Public Defender is Not your Attorney. As a participant of a program based on being clean, sober and healthy, narcotic medications are only taken if necessary and are prescribed. If you have a question to whether or not your current medications are narcotic, speak with your doctor, pharmacist or ask your Case Manager for assistance. No alcohol means no alcohol!!! You must notify the Veterans Court of any medications that you are prescribed. You must also provide medical documentation of said medication for the Court file. Do not take any alcohol based fluids. Expect to take random and scheduled drug tests and breathalyzers at court sessions. Do not tamper with urine samples as they are fully observed. Tampering with your sample may lead to a jail sanction. You are not to go outside of these counties: Floyd, Clark, Harrison, Jefferson, or Scott, Jefferson County, Kentucky only if approved by your case manager or Judge’s approval. If an event or emergency arises, you must contact a Case Manager or report to Court to speak with the Judge. There is a “Travel Permit” that outlines all information needed in order to have the Judge consider granting permission. Ask the Case Manager for further assistance. If your personal information changes (residence, location, phone number, etc), contact a Manager with a full update. If you need a letter written on your behalf for another court, Division of Family & Children, etc, you must contact the Court no later than one week before you need it. Upon entry into the program, you can sign releases for those you want information shared with (friends, family, etc). At anytime, you may add or delete any releases. No information will be shared unless a release is on file. As required by law, release of information for friends or family may be revoked at any time. 42 CFR Part 2. Dress appropriately for Court and all treatment sessions. No shorts, undershirts or offensive, violent, alcohol or drug related clothing items may be worn or brought to any session. If you are unsure as to what is appropriate dress, ask a Case Manager. Do not argue with the Judge or staff. If you disagree with something, state your position in a calm manner and accept what is being asked of you. Do not force or coerce any other program participant into doing anything that may harm or interfere with their recovery. Do not make threats toward other participants, staff, the Judge or behave in a violent manner. Comply with all program requirements. How does the community benefit from a veterans court? Public safety will improve when service members who honorably served, but get in trouble with the law, receive the services needed to reintegrate and contribute to the community again. Repeat crime will decrease by the rehabilitation of veterans within the court system. Our community will save money and resources by using federally supported treatment programs to assist veterans. Taxpayers will save money when the cost of incarceration is reduced. Outcomes for veterans will improve so they are restored as productive and valuable community members. How often is Veterans Court? Veterans Court sessions are held in Clark and Floyd County depending on your risk assessment. Clark County is held every other Tuesday at 10:00 A.M. in the Clark County Circuit Court 1 it is located on the 2nd Floor on the East Wing of the County Government Building at 501 East Court Avenue, Jeffersonville, IN and Floyd County is held every other Tuesday at 10:00 A.M. in the Floyd Superior Court 3, 311 Hauss Square, Room 421 in New Albany, Indiana. 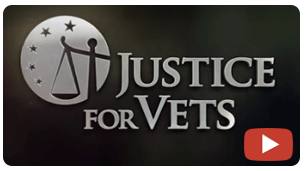 What are the 10 key components to Veterans Court? 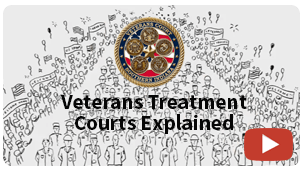 Veterans Court integrates treatment services for military service connected issues, such as medical, mental, alcohol and other drug treatment services, with justice system case processing. Using a non-adversarial approach promoting public safety, while protecting the participant’s due process rights. Eligible participants are identified early and promptly placed in the Veterans Court program. Veterans Court provides access to a continuum of medical, mental, alcohol, and drug treatment and rehabilitation services. Abstinence from alcohol and other drugs is monitored by frequent testing. A coordinated strategy governs Veterans Court responses to participants’ compliance. Ongoing judicial interaction with each Veterans Court participant is essential. Continuing interdisciplinary education promotes effective Veterans Court planning, implementation and operations. Forging partnerships among Veterans Court, public agencies and community-based organizations generates local support and enhances Veterans Court.